Hue Imperial City is famous for tombs, temples, pagodas and shrines, historical heritages and royal cuisine ... If once visit the ancient capital, visitors will recognize many interesting features including vegetarian habits of Hue residents. Besides the unique royal cuisine - the pinnacle of culinary arts in Vietnam, Hue is also known as the city with the "traditional" vegetarian. Referring to the vegetarian, we can not fail to mention the city of Hue. Perhaps nowhere else in Vietnam has rich, diverse, attractive vegetarian dishes as they are in Hue. Vegetarian almost becomes an interesting, unique culinary culture here. Hue eating vegetarian food habits has a long history and receives the support of all the classes in society, from working people to the aristocracy. Vegetarianism was prevalent from the Ly - Tran dynasties to the reign of Lord Nguyen Phuc Chu (1691-1725). In Lord Nguyen Phuc Chu time, the royal family was vegetarians, the princes and royal relatives built their own temples in order to make merit. There is also a massive block called "Trai cung" (Vegetarian Palace), where the King lived and ate vegetarian food before offering sacrifices to the heaven, in Nam Giao - Hue,. The chef in “Trai Cung” were all talented, and they could cook superb vegetarian dishes. With over 400 temples and 230 chanting Buddhist scripture halls, Hue is currently the city which has the most temples in our country. Each village in Hue has a temple, known as "the village temple." Someone once said that, mountains in Hue are not high, rivers in Hue are not deep, but the soul of Hue people are always calm because they know how to practice, pray and eat vegetarian food for the pure soul. In Hue, some people are not Buddhists or go to the temple regularly, but they also have this habit. 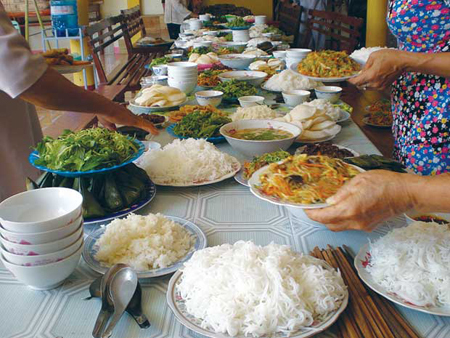 Most women in Hue know how to cook vegetarian dishes and those in form of savoury dishes. Frugal vegetarian feast is also a way for Hue people to express their sincere, endearing love with friends who visit their house. Apparently, Hue is the only place where has this unique culture. 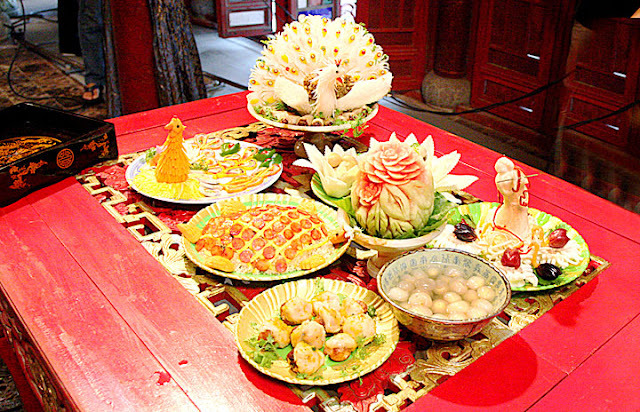 Even earlier, vegetarian feast was an indispensable part in Hue in Tet holiday. Today, this tradition is faded somewhat but in the New Year feast, there are also several vegetarian dishes to offer to their ancestors. Visiting any temple in Hue during the full moon day, or the first day of the lunar month, visitors will be invited to eat vegetarian food by the temple. The food stalls and restaurants also cook vegetarian dishes to serve residents and tourists from everywhere because they avoid killing animals for food in these days. 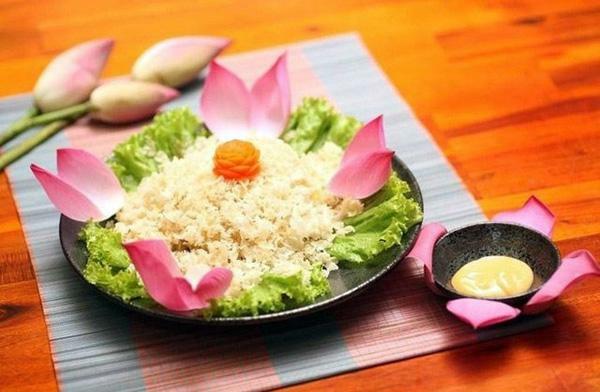 Even in normal days, tourists also easily find many vegetarian dishes in every restaurant in Hue. Hue has some famous "vegetarian food streets" such as in Dong Ba Market, Ben Ngu, An Cuu (only sells vegetarian food in the first day and the full moon day of lunar month). If you like to eat Buffet, you can go to the neighborhood, the street of pagodas, in the west of Hue, along the ancient streets of Phan Boi Chau, Dien Bien Phu, Thuy Xuan. Vegetarian dishes here are rich, affordable, the average price is 20,000- 30,000 VND/ dish. On the streets of Pham Ngu Lao, Doi Cung, Ba Trieu, Nguyen Cong Tru along the south bank of the Perfume River, visitors will easily find the vegetarian restaurant with elegant names: Bo De (Bodhi), Tinh Tam, An Lac, Tinh Binh... Of course, there are also more expensive luxury vegetarian restaurants where use ingredients and spices of Taiwan, Hong Kong, Singapore to serve foreign tourists. The vegetarian dishes menu of the popular just include soy sauce, roasted sesame, peanuts and salt, lemongrass salt, vegetables which are both simple and cheap, the price is only about 10,000- 15,000 VND / serving. In Hue, cooking vegetarian is a process of making art which includes the combination, a mixture of culinary arts and visual arts to create the colorful dishes. Hue vegetarian dishes are not only frugal, delicious, cheap, good for health, but also visually attractive and beautifully decorated.